Custom Printed Sports Bottles are one of the most versatile types of giveaways you can purchase. These sports bottles are inexpensive and fit most vehicles or exercise cup holders. Customized sports bottles are made of long lasting plastic which is BPA-free and comes with an optional retractable sipper spout with push pull lid or straw tip lid. Custom printed water bottles can be given out at school field days or summer camps and can be used for walk-a-thons and marathons. 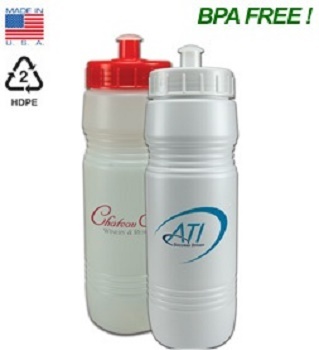 With advertising water bottles you can add your company logo and give them out to employees as a way of replacing plastic water bottles that consistently enter landfills. Reusing water bottles does the earth a favor, so you'll be branding your logo and helping the planet. 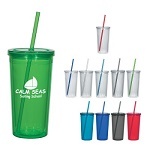 And because the water bottle with your custom imprint is one of the most popular giveaways, they are available in a variety of colors, shapes, and sizes. So be sure to choose any of our custom water bottles for your next event. 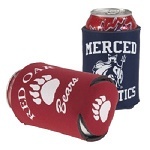 Promote your product or create awareness using Custom Water Bottles with your logo imprinted on our products. Item #SH-0375-CK - Currently on sale! Price includes a 1-color, 2-sided imprint. Hand wash only. CPSIA & Prop 65 compliant. Meets FDA requirements. BPA free. Made in the USA. Lids are imported.